Feeding America, the nationwide network of food banks, recently produced a commercial sung by a little six-year-old boy as he scours an empty refrigerator. Why can’t I eat, eat, eat apples and bananas? The song by Raffi, an Armenian singer and composer, rings true in Luzerne County, Pennsylvania, where 17 percent of families experience hunger and more than 40 percent of children are eligible for free lunches. Joblessness runs high, and the poverty rate is twice that of the state. Fighting these numbers has long been a focus for the Commission on Economic Opportunity, a member of Feeding America; locally, CEO works in cooperation with The Harry and Jeanette Weinberg Foundation, and with support from the McGowan Fund. CEO’s Monsignor Andrew J. McGowan Center for Healthy Living distributes more than 7.7 million pounds of food annually. But in 2017, something changed, and 1,200 families benefitted directly. “We as an organization, through the inspiration of Monsignor McGowan, believe that you always have things to learn,” says Gene Brady, CEO’s executive director. With a well-established food bank, CEO focused on helping people live healthier lives through their diets and transforming how they access and prepare nutritious food. “It starts with the process of getting the whole family involved,” says Brady. CEO launched Healthy Start, a comprehensive nutrition initiative reaching pre-kindergarten children and their families through childcare centers. The program offers fresh produce distribution, education workshops about choosing nutritious options at the grocery store, and cooking classes. 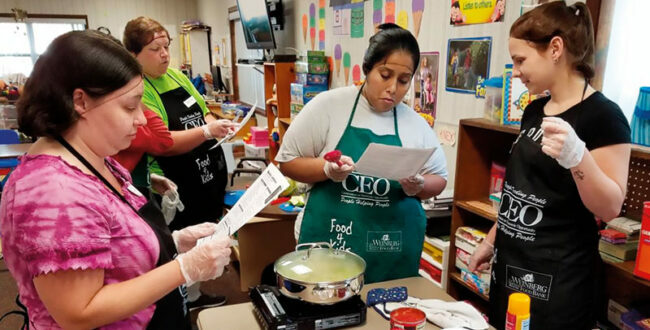 The cooking classes are especially popular: Adults learn how to prepare healthy meals and when it’s time to eat, children join in, unexpectedly becoming advocates—and not just for apples and bananas. One of the most off-putting and successful veggies: rutabaga. (Mashing it made a big difference, notes Gretchen Hunt, director of nutrition programs and resource development.) Another innovation: At one preschool, children shop the Children’s Produce Market on their own before their parents arrive. “To have kids say to their parents, ‘Let’s have it at home!’ is changing the way they’re growing up,” says Hunt.